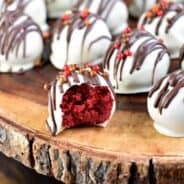 Traditional OREO cookie balls shaped for the holiday season! 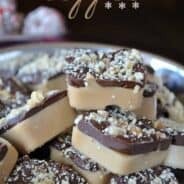 Easy, impressive and delicious too! Please tell me you believe in Santa. Okay, kidding. Please tell me you have had an OREO cookie ball. That’s the question I’m really wondering. You know, one package of OREO cookies crushed up and mixed with ONE package of cream cheese. Roll it up into a ball and dip it in candy coating. Easy peasy. Of course I didn’t want to stop there. I wanted to take it a step further and help you create a little more impressive cookie ball. Like a Santa Hat. What impresses people more than shaped desserts? Haha, I’m kidding. Seriously. Are you impressed? 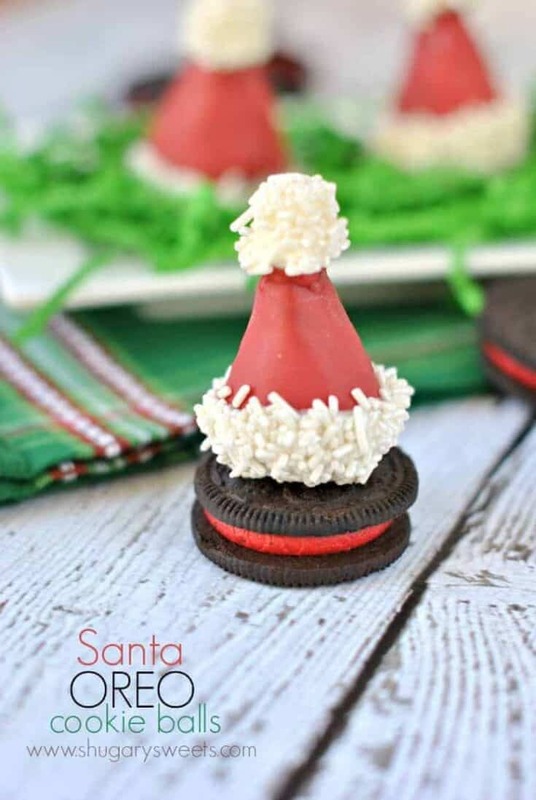 You can go a step further too and use the Holiday Oreos (with the red filling). 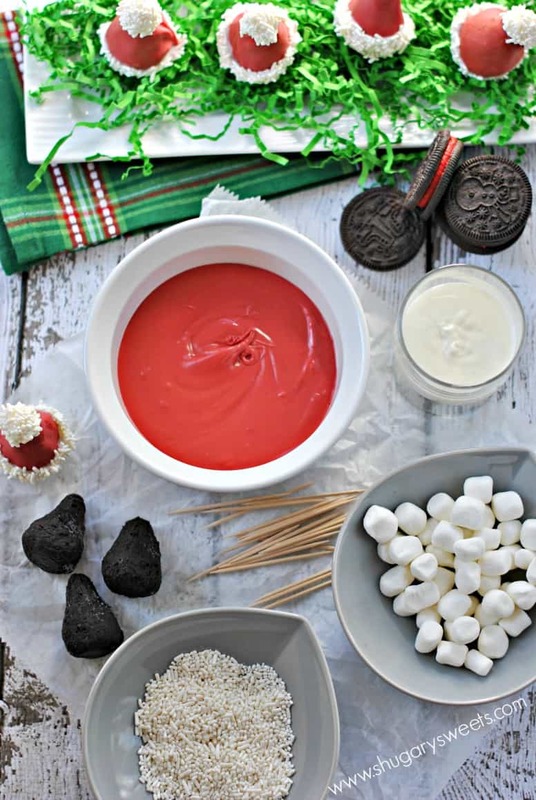 You can use mint OREOS for a minty flavor, or you can add some chopped peppermint candy canes to your mixture for a peppermint twist! So many possibilities! Yeah, we’re pretty much in love with this easy treat. So spread some festive cheer and keep holiday spirits high during this hectic season! Begin by processing OREO cookies in a food processor until finely ground. Transfer to a large bowl and mix with the softened cream cheese until fully combined. Line a large freezer safe baking sheet with parchment paper. Scoop cookie balls with a 1 Tbsp cookie scoop, or a heaping tablespoon of dough. Using your hands, roll into a ball (will be about 1 inch). Pinch the top of the ball and shape until you have a cone, that resembles a Santa hat. Repeat until all dough is used. Freeze cookie balls for at least one hour. Melt red candy melts in a bowl according to package directions. Using a toothpick in the top of the frozen santa hat cookie ball, dip into the red candy coating. Tap on side of bowl so the excess drips off. Set back on parchment paper and repeat until all hats are completely covered in red. Once all hats are covered in red, dip the bottom of a mini marshmallow in red candy coating and attach it to the top of the hat. Allow red coating to harden completely, about 15-30 minutes. Melt white candy coating in bowl according to package directions. Pour sprinkles in a shallow dish/bowl. Dip marshmallow end of hat completely into the white candy coating, then dip into sprinkles. Repeat with all hats and allow to harden (15 minutes). Once tops are hardened, repeat with the brim of the hat. Dip it in white chocolate, then in sprinkles, then allow to harden. These are now ready to eat and enjoy! I store mine in the refrigerator until ready to serve, they keep well in a covered container for up to a week. Change the look and the flavor by changing the cookie! 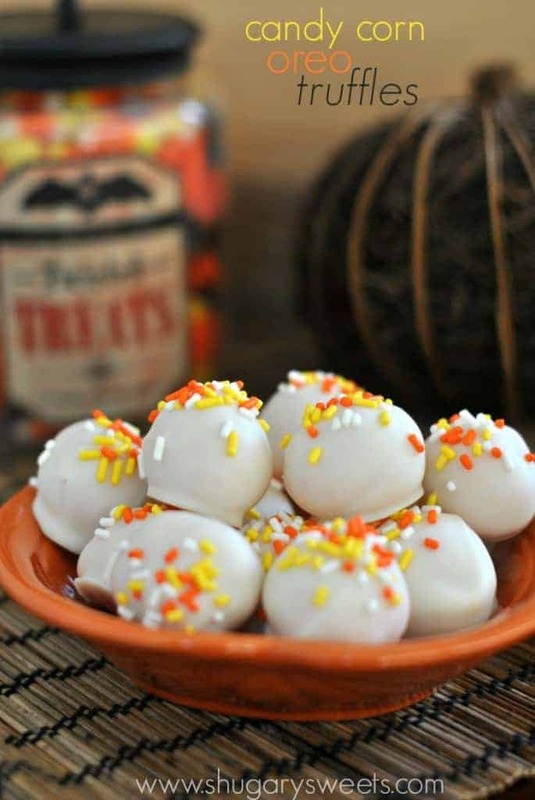 These Candy Corn OREO Cookie Balls use the Candy Corn cookies. 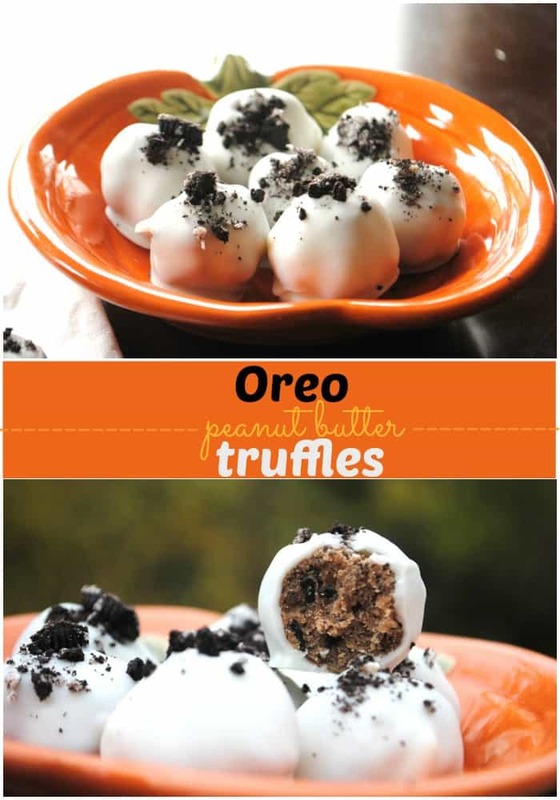 Another delicious twist on OREO Cookie Balls. Add some peanut butter! **Shugary Sweets and OREO have partnered together to bring this recipe to all my fans. While I was compensated for this post, all opinions are 100% my own! These are super cute! and so festive!! Thank you Nancy. We had fun making them! Cuteness times 10! Love the sprinkle tops and rims!!!! You can never have enough sprinkles! My family asks the same thing; for the blog or for us? 🙂 I’d rather have Oreos in this form than plain any day! Absolutely adorable and delicious to boot. Sounds like the holiday dessert to me! It’s definitely a #foodbloggerproblems issue! Ha! INSANELY cute Aimee! Seriously! You just have to smile looking at these 🙂 Pinned! Awww, too sweet Trish, thanks for pinning!! I love these! Oreo truffles are awesome! SO stinkin cute!!! These are addicting!! These are so cute!!! I would feel bad for Santa eating them all. These are adorable!! 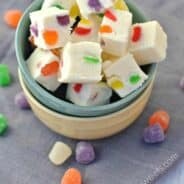 My kids will LOVE making these!! (I’m glad THEY still believe in Santa!! ). Pinned!! Yeah, these pretty much get rationed out so I don’t feel disgusted when they get inhaled without a proper adornment period! Oh my gosh, these are sooooooooooo cute! I just love them and they are so creative! Thanks Jennifer! have a great weekend! Hi! Do you think you could use icing or something else instead of cream cheese? Thanks! You can use canned frosting, but then they would be more like a cake ball, and VERY sweet. Do you just sit them on top of oreo’s when they are done? I didn’t see that step??? Love the looks of these! Hi Kim, I put mine on top of an OREO just for the photo. No need to do that though! Oh My goodness these are straight from Santa’s work shop! Beyond cute! Ahhh, these are so cute! 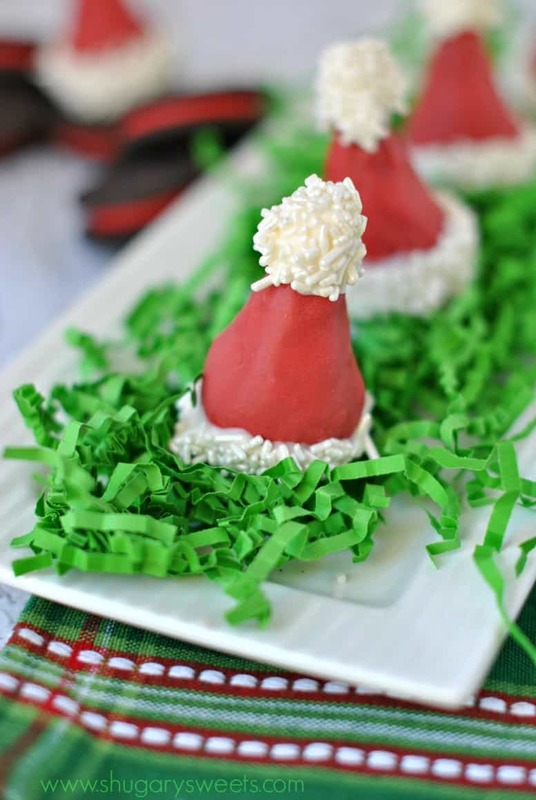 What a clever and party-friendly idea for Christmas. 🙂 Pinning! What are candy melts? Sorry I don’t eat much candy. Thanks for your help. Candy melts are little colored discs of chocolate. I buy the Wilton’s brand (found at Michaels). These are so cute – love them!! 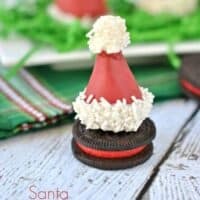 My kids love Oreo’s too so I’m sure they would love these!